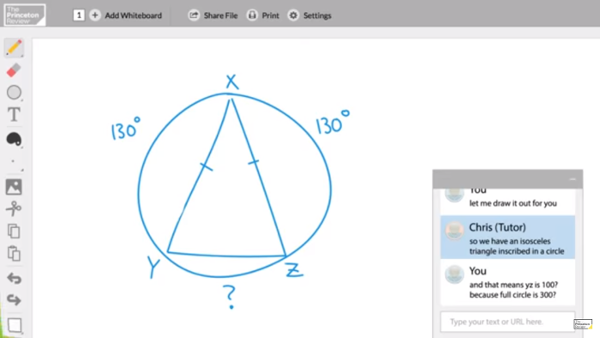 Princeton Review online tutors can answer questions in real time right in the browser. Princeton Review is a company specializing in college admission services, such as test prep classes, tutoring, online courses, and books. The were founded in 1981 by a new college grad who started teaching SAT prep to students in New York City. While they offer test prep for a variety of tests including graduate exams like the GRE, they are best known for preparing students for the ACT and SAT tests and their annual rankings of colleges. 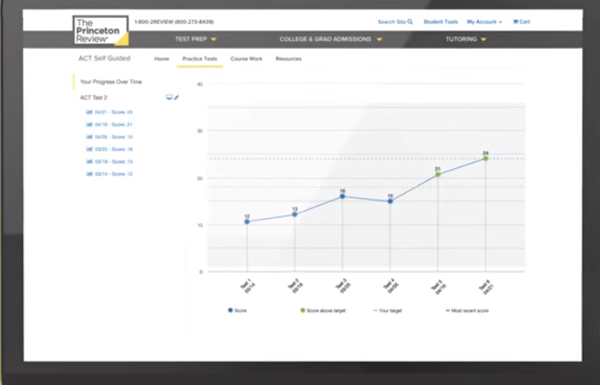 The Princeton Review dashboard tracks student progress. Why Choose Princeton Review for ACT / SAT Prep? The reason to choose Princeton Review is the same reason you choose a Lexus. The premium test prep experience is more important to your family than saving a few dollars with a budget alternative. These guys understand the college admissions game inside and out, and they know how unbelievably competitive it has gotten. They’ve spent several decades perfecting their process for preparing students to compete for spots at elite schools via their trained instructors, classes, and books. They’ve earned their reputation as one of the best ACT / SAT prep services. If you have any doubts as to their passion, watch Paul Kanarek, co-founder and former SVP of Princeton Review practically preaching to parents a few years ago in California. He oozes passion about guiding students through the admission process in elite colleges in California and around the country with Princeton Review test prep. Does Princeton Review Offer a Score Guarantee for the ACT and SAT? Princeton Review does offer a score increase guarantee for all of their ACT and SAT programs described above. If your child’s score does not increase, you’d be eligible for a refund or to repeat the prep review course. I’d recommend reading the fine print on the guarantee, and I’d encourage you to do so. 31+ Students who have previously scored at least a 28 on the ACT are guaranteed a 31 or better or their money back. 26+ All student who take this class are guaranteed a 26 on the ACT or their money back. 1400+ Students who have previously scored at least an 1160 on the SAT (or PSAT) and take this class are guaranteed a 1400 or better or their money back. 1240+ All students who take this class are guaranteed a 1240 on the SAT or better or their money back. These are some of the most best score guarantees in the test prep industry. What Types of ACT / SAT Review Does Princeton Review Offer? Princeton Review has a full lineup of ACT and SAT prep options for whatever your family’s needs are. On one extreme, you can choose private tutoring, on the other an online only option. Here’s a list of some of their current options. Which Princeton ACT / SAT Prep Course? The right Princeton Review course depends on your family’s goals. If you want the traditional test prep experience, the Ultimate experience is the way to go. With the classroom experience, you’ll get a teacher led class, with scheduled hours for your child to be in attendance and clear expectations. For many students, 18 hours of prep (Ultimate 18) will be as much as they are going to want, but a particularly motivated student could do well with the the 25 hours from Ultimate 25. The great thing is that students in rural locations, once shut out of these classroom experiences, can now join these classes online. The tutoring package is obviously the most premium package that Princeton Review offers. It’s not cheap, but your child will get 100% individual attention from the tutor, each trained in the Princeton Review methodology. Having coached elite math team competitors and now doing 1 on 1 mentoring for adults looking to change careers into tech, I can tell you that there’s no substitute for that kind of attention. The tutoring package also comes with a suite of online prep materials including practice tests, drills, and practice questions. Since I originally wrote this post in the Spring of 2018, Princeton Review launched their 26+/31+, 1240+/1400+ courses. I am really excited about these course. Very few test prep companies are confident enough about what they are doing to put a stake in the ground and say, “We know what we are doing should produce this score when a student really buys into our study program.” Princeton Review has done that, and the combination of AI based practice, and proctored tests makes a lot of sense. I think this will be the right program for most families. Click here to start improving your ACT score with the 31+ program or click here to start improving your SAT score with the 1400+ SAT program. What is Princeton Review’s Online Experience Like? Depending on which option you choose, you’ll very likely get access to Princeton Review’s online portal. This allows the student to track their progress, view online video lessons, take practice tests, or interact with online tutors. This short clip demos the online experience. Is Princeton Review Worth the Money? Princeton Review knows their market. They are going after the California family who’s trying to navigate the ultra-competitive state school system. They want the family who’s looking for a spot in an Ivy League school and knows there’s no margin for error on the SAT. They are for the family that is looking to turn a few extra points on the ACT into thousands of dollars in scholarships. They know that even the elite state schools around the country are now able to cherry pick the best students and a great test score is the minimum to get in the game. If you are really serious about the test prep process, they have a proven history of improving student scores, and their new guaranteed score classes are among the most competitive in the industry. Click to learn more about Princeton Review’s guaranteed 31+ ACT score or their guaranteed 1400+ SAT score.